Here's a great fairy tale decoration for a child's room! Measures approximately 15 inches from top of its fuzzy head to the tip of its furry foot. The stitching around the ears and paw pads resembles Annalee's signature furrier stitch. It also features an embroidered letter "A" on the left paw. Measures approximately 11 inches from top of its fuzzy head to the tip of its furry foot. The stitching around the ears and paw pads resembles Annalee's signature furrier stitch. It also features an embroidered letter "A" on the left paw. Buttercup measures approximately 11 inches from top of his fuzzy head to the tip of his furry foot. The detailed stitching around his ears and paw pads has Annalee's signature furrier stitch. He has an embroidered letter "A" on the left paw. NEW OPTION! For just $9.99, you can add a personalized t-shirt to your bear to create a unique gift or special keepsake! Perfect for birthdays, new babies, sports teams and much more! You may add up to 3 lines of 18 characters each. 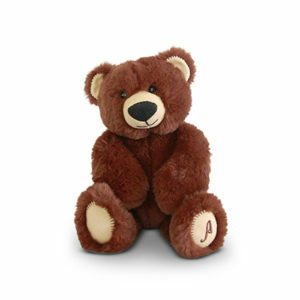 This cuddly teddy bear is 15 inches tall with Annalee's signature furrier stitch, and comes with an embroidered letter "A" on his left paw. This plush teddy bear measures approximately 11 inches from top of its fuzzy head to the tip of its furry foot. The stitching around the ears and paw pads resembles Annalee's signature furrier stitch. It also features an embroidered letter "A" on the left paw.